Due to the previous night’s festivities the day following the party had a unique schedule. Though we were still expected at breakfast at 8am, this was followed up with a walk into the old village of La Alberca, which should take about 15-20 minutes at a leisurely pace. It’s amazing though, how much slower a group of people is than its individual parts. Walking at a comfortable pace at the front of the group with my Spanish partner I was still chastised by a moderator for getting too far ahead. I think it’s wonderful that the group is taken in to see the village during the week. For those of us who come from North America and Australia, we don’t have the opportunity to see little villages such as this frozen in time without venturing beyond our own countries. 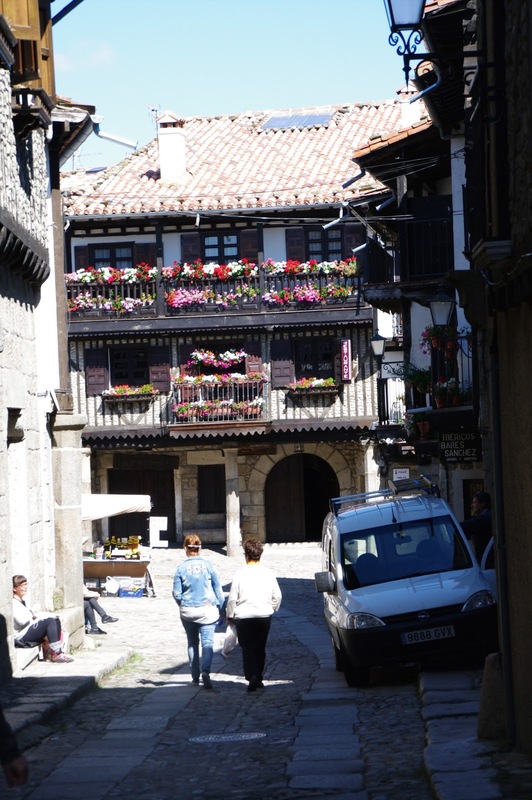 La Alberca is a quaint cobblestone town, whose narrow streets don’t easily accommodate modern automobiles. It is the kind of place where everyone knows each other. In fact, a funeral was in session on the day we went and it appeared that nearly the entire village was in attendance. One of our moderators gave us a bit of a history lesson along the way. 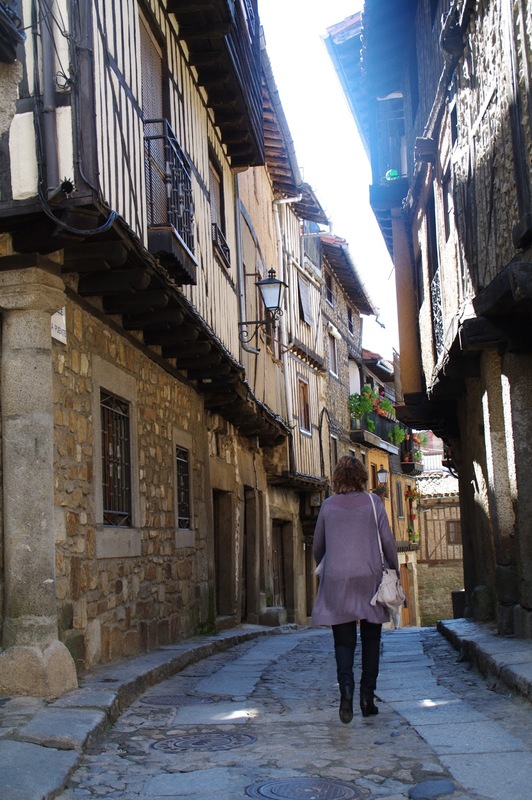 The Camino de Santiago, a pilgrimage beginning in the south of France and culminating in the eponymous town of Santiago de Compostela, in north-western Spain actually passes through La Alberca. This is denoted by the engraving of a sea shell on a wall in the main square. The pilgrimage (which has several routes) has been trekked for thousands (!) of years (earliest records date back to the 9th century), by many different varieties of people searching for some kind of meaning. Though it is a religious journey, concluding in a cathedral, many make the expedition for spiritual reasons, as a means of adventure, or as a way of spending time with oneself without modern distractions. I’m currently reading Shirley Maclaine’s, “The Camino: A Journey of the Spirit”, her memoirs from the pilgrimage. I’m actually planning to complete the trek myself, hopefully within the next year! La Alberca has a yearly tradition of keeping a pig, which roams around the town and is shared amongst the villagers at the end of the year. Allegedly, whomever’s doorstep the pig lands on at dinner time has the responsibility to feed and provide water for the animal. Though I did not see said pig whilst in the village, another Anglo who volunteers regularly and had returned a couple of weeks later sent us all pictures on WhatsApp of the pig. Ham, or Jamon (pr. 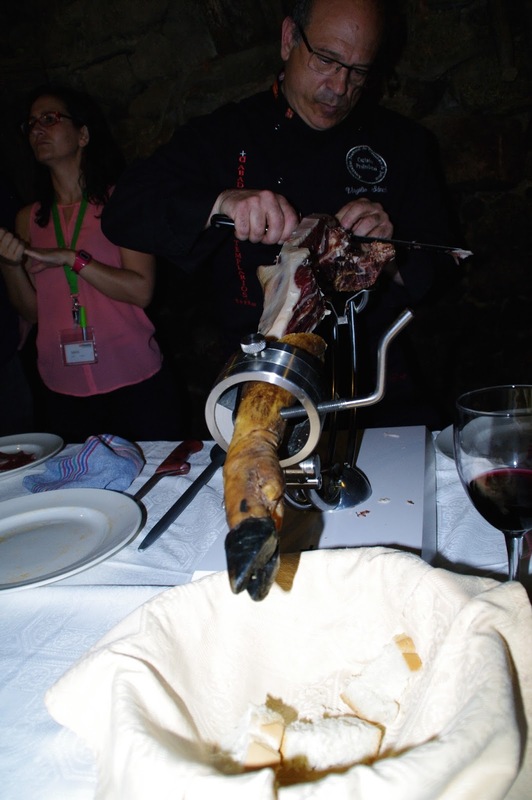 hamon) as the Spanish call it is very popular in La Alberca. A few of the Spaniards picked up some cured ham in the village (the prices apparently are much better in the small town) and kindly shared it with us Anglos. It was of course delicious, very similar to prosciutto, one of my favourites. The owners of the hotel which we stayed at invited us to visit a few of their businesses in the village. 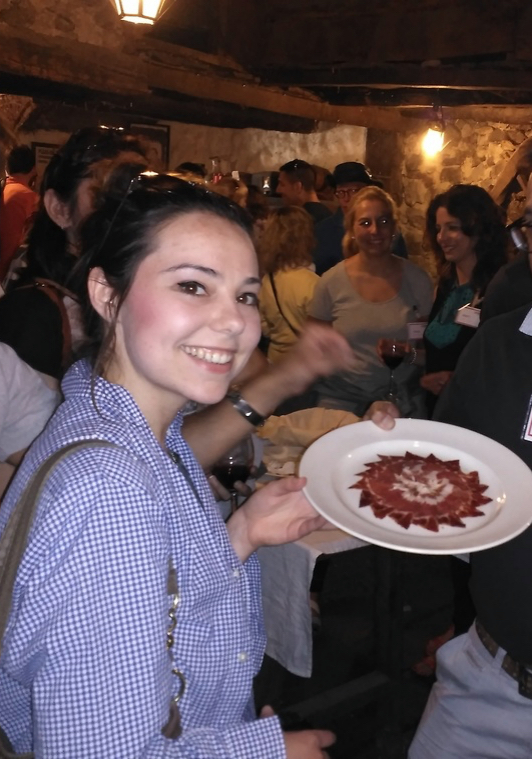 We were invited first to a little ham and cheese shop, which served wine, cheese and cured ham. A leg of ham was positioned on a metal vice, where an artisan could cut off perfectly sliced pieces, which he then arranged in an artistic, mosaic-like pattern on the plate. A few of us, including myself were given the chance to slice the ham, which is done with a very sharp knife in a rocking motion, back and forth. As well, a contest was held, wherein several participants drank wine from a wineskin as the audience counted how long they could pour it for with outstretched arms, this being another Spanish tradition. Following our little wine and cheese party we went to have lunch at a restaurant in town. Gazpacho, a cold tomato soup with plenty of garlic, a delicious Spanish dish, was served as a starter. I began to hit a wall here due to my lack of foresight the night before and nearly face planted in my appetizer, I’m afraid I wasn’t the best conversation at lunch. Our entrée was a slow cooked juvenile ham. I’m not usually a fan of pork as I find it dry, however this was lovely. This skin was crispy and the meat tender to the point of falling off the bone (my apologies to the veggies out there). The option was then given of taking a van ride back to the hotel, instead of walking. Though I normally love walking and would usually opt for a beautiful scenic countryside stroll over a car ride, I gave in for fear of having to sleep walk back to the hotel. This was the one day where I was grateful for and took advantage of the siesta. The remainder of the day followed the typical schedule, save for most of us toddled our sorry, exhausted derrières off to bed after dinner, rather than engaging in the usual conversation in the common room.